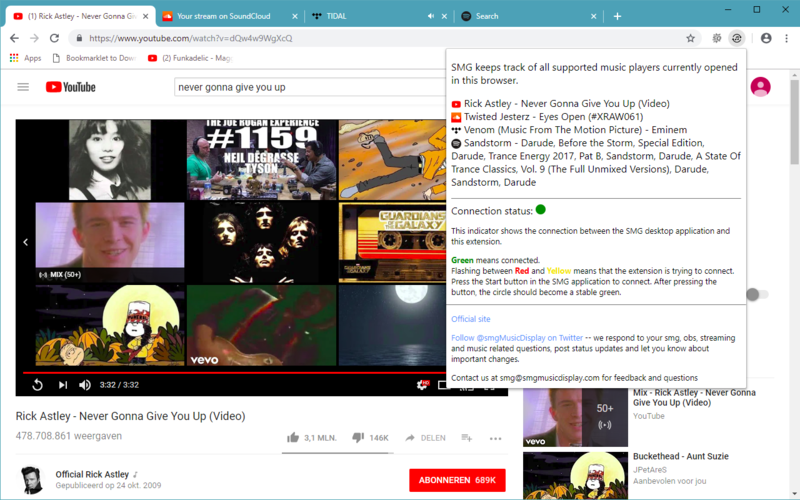 SMG is made for Twitch, YouTube and Mixer streamers, and it works seamlessly with your favorite music players and streaming programs OBS, SLOBS, XSplit and OBS Live! SMG is a small and completely self-contained application. Just extract the zip file and you're ready to go! Your music player is not supported? SMG is crashing? Need an extra feature? No problem, contact support and your issue will be resolved quickly! SMG has been in development for over three years, thanks to this it supports a huge library of music players, amongst others; Spotify, YouTube, pandora.fm and iTunes. SMG is built for streamers, so we support bots like nightbot, nerdbot and phantombot. 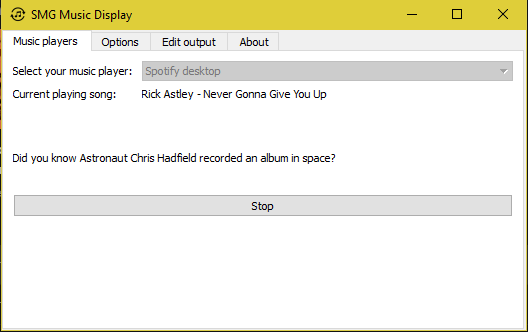 Before you buy, check if your prefered music player is supported, this is the complete list. If it's not in here, let us know and we'll do our best to add support! Literally the best 10$ I’ve spent for streaming. Support this for your music info needs. For all my streamers if you looking for a device to broadcast the text of the music playing software u have @SMGMusicDisplay is the best and easiest program I’ve owned. You're very welcome to throw complaints at us on our Twitter channel. We listen to your complaints! No, your license is yours for a lifetime! My music player isn't supported, what do I do? Send us an email, smg@smgmusicdisplay.com. What do I get when I purchase SMG? You will receive a personal license that can be used to activate SMG. Am I allowed to share my license? No, but we trust you not to abuse your license. Am I allowed to use my license across my own computers? Yes, you are allowed to use your license across multiple pc's and laptops. SMG is not working well, how do I fix this? Delete the config folder, and see if the problem persists. Otherwise, send us an email, smg@smgmusicdisplay.com. Please attach a screenshot of your problem. What are the system requirements for SMG? SMG works on all recent versions of windows, Windows Vista, Windows 7, Windows 8 and Windows 10. Where can I download SMG? You receive the download link after you've paid. Otherwise, you can click this link to download smg. © 2018 Streamsoft. Streamsoft is a sole-proprietorship registered in the Netherlands. For business enquiries, use business at smgmusicdisplay dot com.